The John Hewitt Bar & Restaurant is not only a place to imbibe, dine and socialize, although it is that too, it is a place of cultural and artistic expression. It is a place where the socialist and artistic ideals of the late Belfast poet John Hewitt are nurtured and cherished. The attraction of The John Hewitt is its atmosphere; it is a pub where you can go for some conversation. There is no intrusive background music, no television, no juke box and no gaming machines. 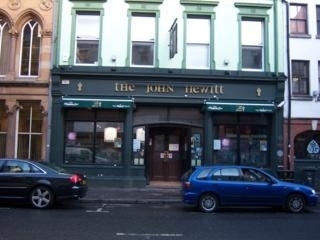 The John Hewitt is located beside St. Annes Cathedral, on Donegall St. and is a goo place to find live traditional music. Have you got Google Earth on your computer? If so, then download the Google Earth view of The John Hewitt. Is this the wrong position for The John Hewitt? If you think so, then modify its position. Click / Tap the button above to get directions from where you are to The John Hewitt. I used to be a big fan of the hewitt,as the gigs can be excellent, but lately ive found the staff rude which has put me of going there as much as i used to. its a shame really. i dont know whats happened why its just turned like this. Maybe new staff i dont know, although one of the managers can be extremely rude to. Me and a mate sat down at a table and were asked to move because we weren't ordering food - and bizarrely this pub likes to flaunt its real ale credentials. Visited the John Hewitt in early August, a great pub with a wonderful atmosphere. The staff and other customers were very friendly. No TV�s, Gaming Machines, or Juke Box�s , made a very pleasant change from other bars I had visited in the City. The Manager had a brilliant knowledge of the city and was incredibly helpful, he also had a great passion for the Beers the bar sold, the best choice I have ever witnessed in a pub. Beers from local brewery�s and from different places around the world. I wish I had ask his name, but look out for the gent with the glasses. The food served in the bar was fresh, extremely well cooked and presented. As far as I am aware food is only served during lunchtimes. I recommend this venue to anyone visiting the City of Belfast and to everyone already living there. `THEE BAR` in downtown Belfast simply because the profits don`t go into a greedy persons pocket! It is uniquely owned by the Belfast unemployed centre where the profits go to better usage than someones bank balance. It was pretty packed when I was there and although there ws a nice atmosphere, they didn't sell drinks that I liked. I loved the traditional but there wasn't much room to stand let alone sit down so I went to the Duke of York instead. What more do you want for a night out? I have no choice but to go back!! But a GREAT Bar none the less. Really cant find anything to fault with the way its run, the quality of the food, beer or entertainment. The ever changing displays of work by local artists is interesting as well. Makes the place seem "different" each time you go in. But, yes I agree, the Staff should keep their politics to themselves. I asked for a Miller. I got the following reply from the barman - "We don't sell American beer. It funds the war machine. You should be ashamed of yourself." If it hadn't been a friend's party I would have left. For a bar that promotes 'traditional music' etc. you're not going to attract tourists with that attitude." A wee bit 'Artsy' and 'hippie' for me but some people like that. It had nice bar staff and I think the overall feel is a warm local with most people knowing eachother. Loved the music and atmosphere, attended The Old Flattop Music Club, wonderful!! Excellent bar great choice of drinks! Gets stuffed at the weekends which is a good sign. One of the few real good bars left in this city! Smashing bar, with a social consience too! Great beers. Great service. Great food.